Constable Cheyne Kynoch with police dog Johnny. PEOPLE are used to hearing about police dogs sniffing out crims. But WA Police also uses them to control public disorder in a three-pronged approach with horses and regional operations group officers. 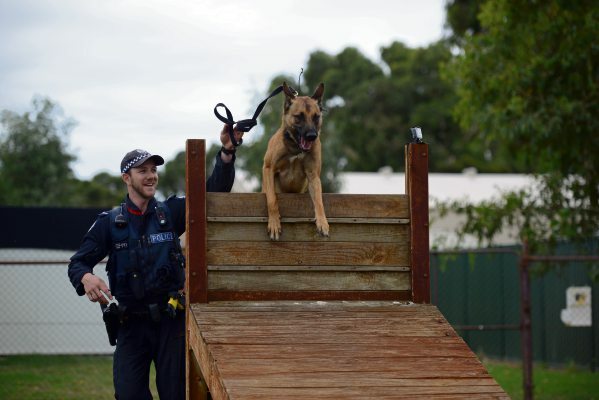 And Assistant Commissioner Kellie Properjohn said visitors to this Saturday’s WA Police Expo in Joondalup would see the dogs in a simulated disorder event and be impressed with “their ability to be so disciplined”. The public will also be able to meet drug detection dogs and their handlers, along with riders and horses from the mounted section. Other highlights in the free expo include the bomb response robot, police helicopter, forensics demonstrations, a recruitment booth and a chance to try out police entry requirements such as beep and grips tests and push-ups. There will be a former Eagles premiership player, prize giveaways and mascots Constables Care and Clare. “Come and see what WA Police do, have a chat and get to know us,” Ms Properjohn said.